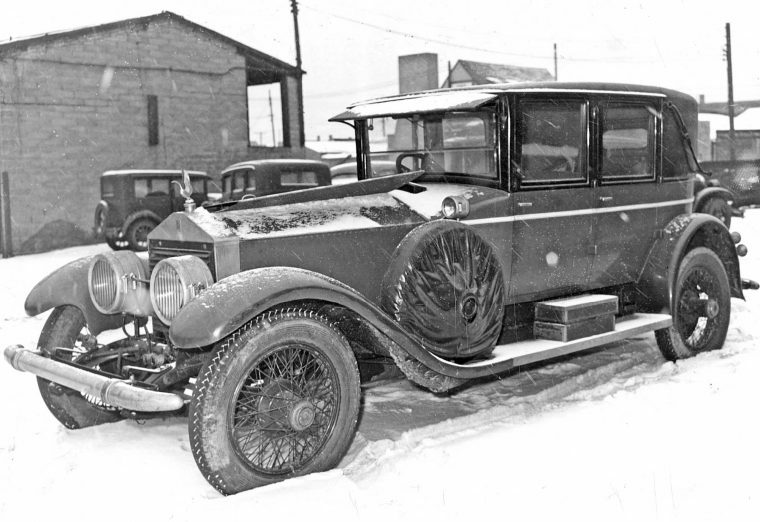 February 2, 1941 was the day that World Heavy Weight Champion (1919 to ’26) Jack Dempsey’s 1924 Rolls-Royce “Silver-Ghost” saloon was turned into the United States Wrecking Co. to be scrapped. The Wrecking Yard was located at 1728 Washington Avenue in Minneapolis, MN, and these images of it were taken by a staff photographer for the Minneapolis Times-Tribune. It is possible that the Hennepin County Library that has these photos in its collection misdated them when cataloged and the pictures were actually taken a year later in 1942. The US entered World War II on December 8, 1941, the day after the attack on Pearl Harbor and shortly afterward scrape drives began to support the War effort. Americans from all walks of life felt it was their patriotic duty and contributed unused cars, trucks, machinery, metals, and rubber. 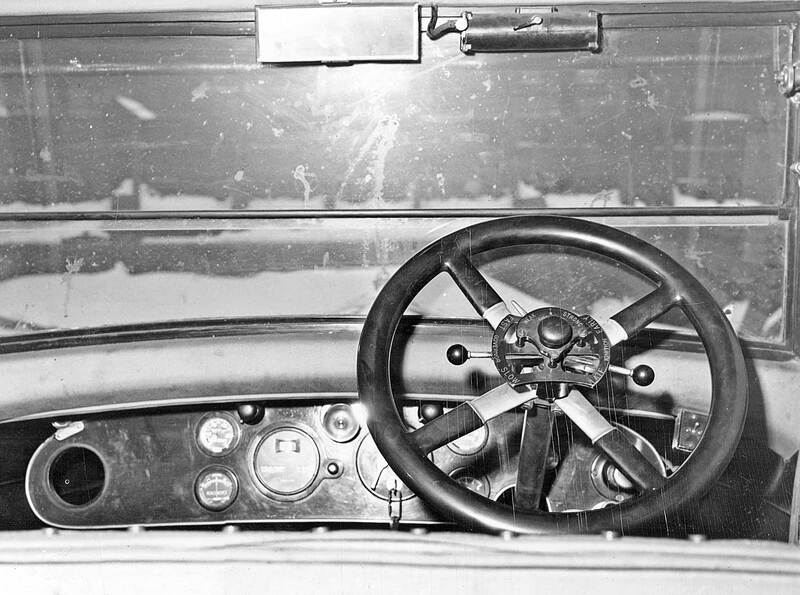 Expandable views of the drivers compartment (above) and (below) the 1924 Rolls-Royce “Silver-Ghost” saloon. The Boxer, still a celebrity at the time or whoever owned the seventeen-year-old car apparently turned in this Rolls as a high-profile donation to bring attention to the scrap drives. Later on June 8, 1942, Dempsey supported the War effort by accepting a commission as a lieutenant in the US Coast Guard Reserve in New York City as the Director of Physical Education. He was later promoted to a Commander and spent time on a number of warships including the USS Arthur Middleton during the invasion of Okinawa in 1945. Share with us anything you can add to this post or find of interest in the photographs. This entry was posted in Auto photos 1921 - 1942 and tagged Champion Boxer Jack Dempsey, Rolls-Royce Silver Ghost. Doesn’t look like a Rolls hood ornament. I understand the governor and spark advance controls on the steering column; but what is the control marked “weak” and “strong”? Two level horn? Fantastic vehicle. Such a loss. Right hand drive so probably not a Packard. Note the suicide front door. So many great cars were turned into scrap. The sad part was the scrap metal really wasn’t needed, but it allowed every citizen” to participate in the war effort.” I remember. Fuel mixture. Thanks, Dave. Had me stumped. It was a 17 year old car in a time of rapid technological advance. The future value of these old cars wasn’t realized at this time and and especially these big early autos were truly valued only as scrap at the time. Repair parts often were not easily available and the vehicles themselves were primitive in design and operation compared to “current” models offered at the time. The few that survive were expensive to own and operate as well further making them ideal candidates for the scrap yard in what was still a depression economy. We are fortunate that any survived for us to enjoy and appreciate. Thanks for sharing these pictures and information with us. Besides its intrinsic value as an excellent car, this Rolls-Royce would today have a certain historic value, too. Surely any sensible person would have considered that value before scrapping it, or did Dempsey do it just for publicity? I also wonder what he replaced it with. With a warship….at least for part of the time..
Hi, Frank. I recall seeing a photo of Jack in a 1929 Chrysler Imperial roadster or convertible coupe – an enormous car with the odd thin-ribbon radiator shell. (I’ll look it up) I guess Jack was aching for something a little more racy. The steering wheel is weird.Never saw one like it.Appears to be rubber. Also the hole in the dash on the left. The hole is where the clock should be, could have been taken out as a keepsake. The hole in the dash is where someone has made off with the clock. The steering wheel was a cast aluminium spider with a steel rim and encased in celluloid; hard wearing, comfortable to use and warmish in cold weather. The steering wheel is more likely to be some sort of dark wood or possibly Ebonite. The hole in the dash is probably due to someone removing the clock – back in the day, they made nice “domestic” clocks when mounted in a wooden frame or stand and you often see car clocks from that era modified in that way at flea markets and in antique stores. Don’t be too hard on Jack…If the Rolls were in its native country, it very well could have had the same fate…or ended up as a tow truck, ambulance or truck/tractor. I just read an article in a popular UK classic car magazine, many newer cars of that ilk were requisitioned by the government for VIP transport and suffered all sorts of damage and indignities. Quite correct – although such cars were more likely to be converted into ambulances, fire trucks and even armoured cars at the beginning of WW2 over here in Britain. That certainly happened to many large 1930s American cars with the result that right hand drive examples are quite scarce now. I’d be a bit surprised if the steering wheel on a Rolls of that era was celluloid covered as that was inexpensive and was used on “humdrum” cars for ordinary folks. I read where several people were lamenting over the loss of this car and mentioning the owner(s) should have known better. Automobiles such as this one did not have the aura then as today. During that time they were just “old cars”. I remember seeing Duesenbergs, Cords etc. in wrecking yards during the forties and fifties. In fact during 1952 in high school I worked at a combination gas station, used car lot, repair shop. They had a wrecker made from a 32 Cadillac V 16 roadster with the rumble seat removed and a winch installed. It was really nice without a scratch cream w/black fenders and powerful, but it was also a handful to drive for the wheel required “mighty Joe Young” effort to maneuver but it performed it’s assigned tasks well. ALAS!! Just curious as to how the Rolls Royce ended up in Minneapolis. Jack Dempsey had homes in both the NYC and Los Angeles area. Assume he owned the RR for a short period. Do know he bought a Model G duPont in 1929/30. Stan Smith, I was going to ask the same thing. I live in Minneapolis and as far as I know, Dempsey had no connection here. Or at least I’ve never heard of one. Dempsey was good friends with middleweight boxer Sam “Augie” Ratner, who lived in Minneapolis and had a bar on Hennepin. For those who mourn the loss of this R-R, his Springfield-built Murphy-bodied ’27 touring car (it was delivered to him on 8/28/28) does survive. Its second owner was Victor Fleming, the director of “Gone With The Wind.” And it was last sold by Soulis Auctions in Kansas City. It was black with a tan top and a red interior at that time. And, of course, with left-hand drive. 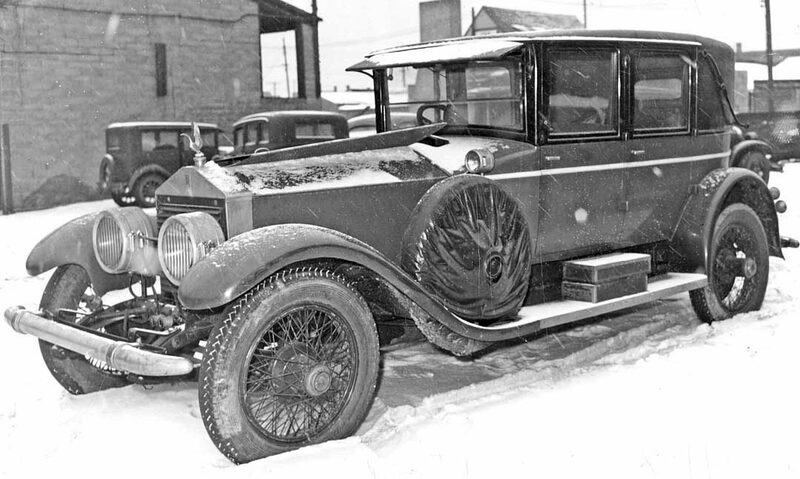 This car looks to be a 1924 Rolls-Royce of America (Springfield MA) Tilbury Sedan (a Brewster catalog body). A year later (1925) Rolls-Royce of America would purchase a struggling Brewster & Co to support it’s own body production. Additionally, they would switch from right-hand steering to the left-hand steering (cars built by Rolls-Royce of America). It appears to be a Springfield, MA built version, due to the recessed hub centers. (The British built RR Ghosts and Phantom Is had a smooth face on the hub center.) Presumably, the Springfield factory, which opened in 1921, was building RHD versions until they got did the necessary engineering to allow a “central change” gearshift instead of the traditional one at the extreme right of the driver’s compartment? Note the lack of front brakes as well. RR didn’t incorporate them until the mid-20s. RR has traditionally been hesitant to embrace new technology until it was fully sorted out. Front brakes are an ideal example. Ghosts are worth some serious money these days! A lot of beautiful classics were scrapped during WW II in support of the war effort. Such a shame to see it die that way, but maybe several American boys lived because of this.